Donations to our school are fully tax-deductible. The school is a 501(c)3 non-profit organization. Donations can be mailed to Youngsville Academy, PO Box 250, Youngsville NC 27596. We offer a number of ways for businesses and individuals to participate. These include an annual fundraiser and a program for major donations. For major donations, there is a Sponsorship Opportunity. The sponsorship opportunity offers individuals and businesses a chance to receive permanent name recognition in our facility. For a major donation of, for instance, $25,000, the K-8 athletic field would be able to be permanently commemorated to an individual/family/or business. 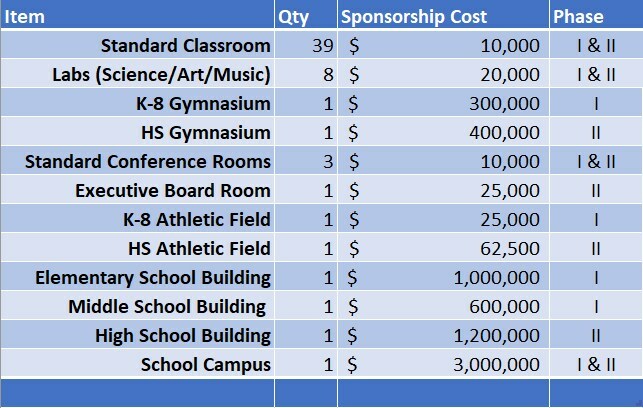 If you making a contribution for a Sponsorship Opportunity, please contact Dan Henson at Dan.Henson@youngsvilleacademy.org.